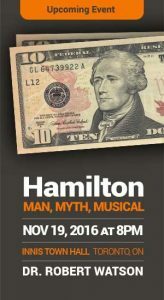 On Saturday, November 19, ProfTalks Lectures is proud to present a talk by award-winning historian, Dr. Robert Watson, on “Hamilton: Man, Myth, Musical”. Join us as Dr. Watson reveals the fascinating story of one of America’s most important founders, Alexander Hamilton and the phenomenon of the Tony Award-winning musical by the same name. Don’t miss this captivating presentation! Innis Town Hall at the University of Toronto, 2 Sussex Ave, November 19, 2016, 8 p.m. Tickets on sale now: www.proftalks.ca. Don’t delay – seating is limited!